We bought this house as a 3 bedroom. When we figured out how to move it around and make it functional, it actually turned it into a "4 bedroom". If you're new here, we live in a 1930's farmhouse with three VERY SMALL closets. The house we moved from in California when my husband got out of the Marine Corps had SEVEN closets. This house is much smaller than the one we had there. I've had to turn one of the small bedrooms into my closet/storage/cleaning closet/linen closet/the list goes on and on... before we moved the house around, this was our bedroom. It has french doors looking in right when you enter the front door so everyone could see our business. I hung curtains up but still, it was an odd location. Our bedroom is now at the back of our house and this has now become my office/picking room. I call it a picking room because I pick the finishes for new construction homes and I've collected quite a few samples over time... but it hasn't been a pretty picking room. I ended up throwing things in here just to get them out of the way and I hate that I did that. I also put all the boxes and bags of stuff i'm getting rid of in here as well... I finally had enough. I plan on putting all my extra decor in here and organizing it on some shelves so it's easy to get to when I want to change things up. Currently it is already in here, just shoved in a corner and not at all easy to see and get to. This big white table was brown about an hour before I took these pictures. My dad made it and it was originally a picnic table set, I have one of the benches in our kitchen at the table. This was my husband and I's first kitchen table so it's not going anywhere but that doesn't mean I can't paint it. I still have to paint the legs, but I'm loving how it looks white and it's the perfect size for laying out tile and paint. I wanted it to be plain white so it doesn't confuse my eyes when I'm picking for a house so I just used a white from off the shelf and I love it. I actually did that when I painted my kitchen white, and I've had people ask me the color. As a designer, I feel kind of silly saying it's pre mixed regular white paint at the hardware store. I got the little white lamp at a thrift store the other day as well, it had a plastic shade but I took that off and put an Edison bulb in it. I love how it modernizes a very vintage piece. I moved my computer in here along with my favorite desk I stole from my mom ;) I always keep a coaster because at this job, it's acceptable to drink wine (currently sitting here typing this with a glass of wine) Carpe Vino! That chair though..... HEART EYES! Ok, here is the plan for this room, there's lots to come and I'm super excited about it! 2. Wallpaper the back wall. 3. Hang a new light fixture. 4. 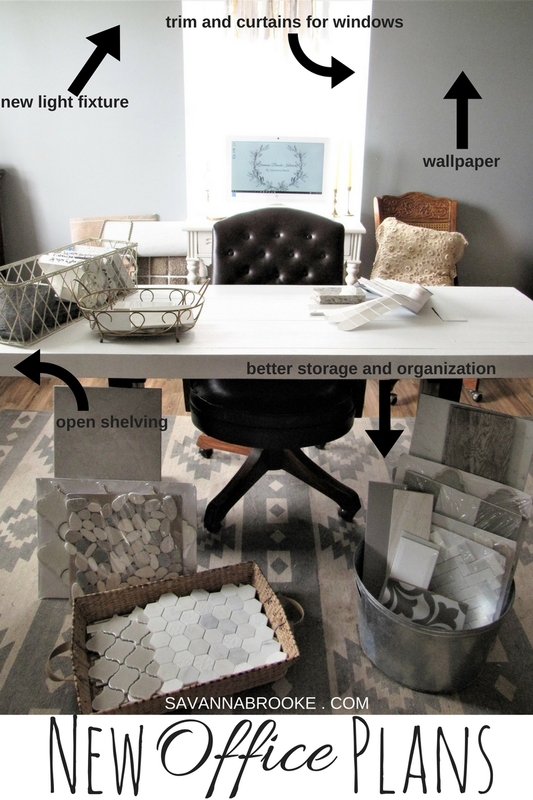 Get better storage bins and baskets for tile organization. 5. Build open shelving on one wall to house all of my extra decor I'm not using at the moment. 6. MAYBE paint the other walls. 7. Finish painting the table. 8. Add trim and window treatments to windows. I hope you enjoyed this peek into my new office/ picking room. I'm super excited about it. It's so nice to have my own quiet place to go and work (after work) and if I want, I can just open the doors and be with my family at the same time because it's right off of the living room. Thank you so much for stopping by to see what I'm up to and have a wonderful week friends!! Birthday and Anniversary Month GIVEAWAY! !